"A tasty combination of quinoa, avocado, cumin, and lime juice with fresh veggies for a delicious meal!" Bring the quinoa and water to a boil in a saucepan over high heat. Reduce heat to medium-low, cover, and simmer until the quinoa is tender, and the water has been absorbed, about 15 to 20 minutes. Spread into a mixing bowl, and refrigerate until cold. Once the quinoa has chilled, gently stir in the tomatoes, cucumber, and onion. Season with lime juice, cumin, salt, and pepper; stir to combine. 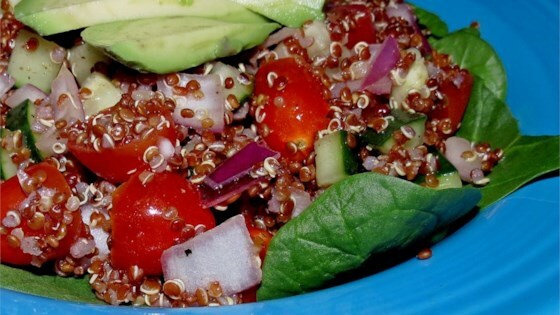 Divide the spinach leaves onto salad plates, and top with the quinoa salad. Garnish with the avocado slices to serve. Be sure to rinse the quinoa thoroughly before cooking as there is a bitter coating on the grains. Regular quinoa can be used in place of the red quinoa (they taste the same). Red quinoa is usually found in the Organic section of most grocers or also in bulk food type stores. Wow, what an easy and delicious dish to prepare! I worried there might not be enough seasonings but this dish was flavourful and refreshing. Used regular quinoa and LOVED this - also cooked quinoa in chicken stock rather than water. Next time may add a kick of cilantro. Great recipe and a crowd pleaser! So good, and so simple!! I've made this a few times with some slight variations. I have found that the recipe as written is the best!